This week marks the 70th anniversary of the Battle of Arnhem. To commemorate the occasion, we are serialising William’s short story, The Bridge, which is set against the backdrop of the infamous battle, which took place between 17th and 26th September 1944. ADVISORY: This story contains adult themes and occasional strong language. He looked in the direction she indicated and saw that the man and woman he had seen in the window were now standing at the gate of the house. They were smiling and the man beckoned them over. As they began to cross the road, he opened the gate and came toward them. He seemed not to hear but stared intently at the woman. The man lead them into a large, bright room, sumptuously equipped with every modern convenience. The Dutch couple exchanged glances. ‘How is it different? He said it was different,’ the man asked, quizzically. The four of them continued this banter for some time, laughing at each other’s jokes and asides and appearing for all the world like people who had known each other for years. Shirley was completely at ease as though at home, extrovert, talkative. Per appeared captivated by her and was enjoying himself immensely. The two of them seemed to relate. Bill and Druschke were more subdued. He crossed over to the window and looked out. Shirley rose and joined him. Everybody laughed as Shirley gave him a playful shove. The two left, chatting noisily to each other. They sat for what seemed an age, just looking at each other across the table. She was still very beautiful. Her pageboy hair, full about her face, was now tinted with traces of silver. He wanted to speak but the lump in his throat made him mute. He saw that she too had tears welling up in her eyes. She began to cry, the tears running down her face. He leaned forward and gathered up her hands in his. She looked up and in her tear-wet face, he saw the girl he had so desperately loved. He fumbled in his pocket for a handkerchief then leaned across and began to wipe her face and eyes. She took the handkerchief from him and rolled it tightly in her hands. As she looked more deeply into his face, she saw his chin quiver slightly. He swallowed deeply and looked away. They heard the other two coming up the garden toward the house. She stood up and, sniffing loudly, began to wipe her nose and mouth with the back of her hand. She was still clutching his handkerchief. She smiled and exhaled a short sobbing laugh. She dabbed at her eyes and nose, then turning quickly, she left the room. She regarded him, head on one side and an enquiring frown began to gather her brow. Per intervened quickly. As they moved into the hall, they saw her descending the stairs. Per could see she had been crying, her eyes were puffed and red, despite her efforts to conceal this with makeup. They left the house and crossed the road to gather by the car. ‘Ah, so.’ They shook hands. ‘Shirley, it’s been a pleasure. But it must be goodbye, yes?’ Per held out his hand. She then turned to him and he looked at her as he had once before, so long ago. ‘You called him Tommy. Why Tommy?’ asked Shirley, perplexed. They watched the car until it disappeared into the traffic across the bridge. They turned and walked slowly up the path back to the house, closing the door behind them. They were on the ring road now, heading for the autobahn. It became clear to her now. His strange behaviour at the house and the way that woman had looked at him and spoken to him and referred to him as a soldier. He made no reply. He stared at the road ahead, strangely silent, almost in a reverie. She looked at him intently, uncertain of her feelings. Still silent, he glanced up into the mirror at the receding skyline and the bridge. He felt at peace, content at last. A harrowing episode in his past had now been purged. He would never again look back in anger at the Pyrrhic arrogance of those who sent them there to die, or rage at the atavistic stupidity of those tribal old men who gathered annually to celebrate the carnage. He would now only recall that for a brief and precious moment, a sensitive, desperate boy had found solace and hope in the selfless love of a beautiful girl. She placed her hand on his leg and gave it a gentle squeeze. Then, taking a tissue from its box, she wiped away his tears. He nodded and quietly cleared his throat. I hope you enjoyed reading The Bridge. If you did, why not download the ebook to keep? Please consider leaving a review on whichever site you download from. It all helps us to get William’s writing discovered by other readers. Thanks. Today, we continue with part 4 of the story. Click here for Part 1, here for Part 2 and here for Part 3. Further instalments and Arnhem themed posts will follow over the coming days. The boy ran through the gate toward the house, past the rows of stretchers and body bags, through the clumps of tired, filthy and dejected young men nursing what the medical officer had defined as minor wounds. He bounded up the steps and into the house. Running to the door of the cellar, he shouted down. He ran down the hall and into the kitchen. The large, flagstoned room had been used as an emergency first aid room and surgery throughout the nine day battle. Even though he had seen it many times he still could not overcome the feeling of nausea at the sight of this carnage. The broken, mutilated bodies of young men, sedated by morphine to mute endurance, lay about the floor awaiting attention. The doctor was operating on the kitchen table, the large oak trestle around which they had enjoyed many a family meal before this madness had begun. The sergeant was sitting on a low stool staring dejectedly into the grate of the kitchen range. The girl stood beside him, her arm around his shoulder. She was gently stroking his hair. He stood up slowly and, turning, kissed her lightly on the forehead. The sergeant pushed her gently down on to the stool. The doctor stood stock still, his hands, bloodied from his work, held up as if in surrender. The boy looked expectantly into the sergeant’s face but there was no response. He stared vacantly out over the head of the boy for what seemed like an eternity, then slowly he turned to face the girl. She watched him, mouth agape and saw his head drop slowly until his chin touched his chest. Then he began to cry, at first softly, but then his young body racked with convulsive sobs and he gradually sank to his knees onto the cold floor. The doctor lowered his hands slowly to his sides and surveyed the tragedy around him. He looked at the boy, incredulous at the human frailty of his hero. He saw his daughter, her pretty face drenched with tears, unable to move, not fully able to comprehend the total abjection of her beautiful soldier, her first young love. He looked down at his patient. There was nothing more he could do for him now. He was already dead. He was always going to die. Crossing to the sink, he washed the blood from his hands and rubbed them on his apron to dry them. He then moved to stand before the sergeant. He had stopped crying and just knelt, his head hanging in total despair. Lowering himself on to his haunches, he placed a hand on the sergeant’s back. He became more animated now and walked over to Pieter, taking hold of his arm. Glaring at the doctor, he began to shake the boy violently. They stared at him, shocked at the profanity of his outburst. They had never heard such language from him, in contrast to most of his comrades. As his raving became increasingly incoherent and the doctor could see he was losing control, he crossed to the dresser to prepare a sedative. Coming back to the sergeant, he unprised his hand from Pieter’s arm and the terrified boy fled from the room. Gathering himself, the sergeant allowed the flicker of a smile to cross his face. He took the potion and swallowed it in one gulp. ‘Why? What’s it going to do, kill me?’ He began to chuckle, but then to laugh hysterically. The sergeant sank onto the stool and began to drink the gin from the flask. The doctor went over to his daughter. Grasping her hands in his, he pulled her to him. But he could not hear her. They left the room quietly, heads bowed. As he turned to close the door, the doctor took a last look. The wounded, the effects of the morphine now wearing off, had started to moan softly. The man on the operating table stared through dead eyes at the ceiling, the rictus smile set in his blackened face. And the sergeant, who had so bravely endured nine terrible, savage days, now sat on the stool, stupefied with gin. He was rocking back and forth softly humming to himself. Today, we continue with part 3 of the story. Click here for Part 1 and here for Part 2. Further instalments and Arnhem themed posts will follow over the coming days. She lay awake, the anxiety heavy in her chest. It was very quiet in spite of all the British paras who had been deployed around the bridge and throughout the village. She could not shake this feeling of apprehension, she knew something terrible was about to befall them all. The Germans could not allow the British to deny them access to the bridge and they would come to destroy them. The sergeant had confided to Jan the fact that the presence of the Panzers had been unknown to them and that it would not be possible for the lightly armed paratroops to hold out for more than a couple of days against an armoured attack. She eased herself up and leaned back against the headboard. Her husband woke with a start. The explosion blew the windows in. Had the heavy curtains not been drawn, the girl would have been lacerated by flying glass. She bolted upright and began to scream uncontrollably. The doctor rushed into the room and gathered her in his arms, trying to calm her terror. There was pandemonium outside and he knew he must get them all to where they would be safe from stray fire and small ordnance. He tried to raise his daughter but she had begun to whimper softly. His wife entered the room. He could see she was making every effort to compose herself but she was obviously terrified. She crossed to the window and drew back what was left of the curtains. A cry came up from the pit of her stomach. She repeated the words over and over, not crying now, but almost to herself. She had clutched the lapels of her dressing gown together and held them tightly under her chin as if to offer protection, and as she moaned she moved up and down on her toes, rising and falling in rhythm with the words. The doctor released his daughter and crossed the room to his wife. He looked at the horror below. The Germans had attempted to cross the bridge and the paras had hit them when they had little room for manoeuvre. The leading vehicle, a light armoured car, had been hit by some sort of anti-tank weapon, its cargo of ammunition had exploded and it was on fire. Following was an assortment of armoured personnel carriers and other vehicles. The bridge was blocked and the column backed up into the darkness beyond. The leading personnel carrier had also been hit and was ablaze, its human cargo already dead or burning to death as he watched. The paratroops, concealed behind the parapets and newels of the bridge, were raking the column with machine gun and rifle fire. It was a massacre. His attention was drawn by some activity immediately below, just outside the house. Two paratroopers were lying in the road operating what appeared to be a length of guttering with a bipod at the front and a shoulder stock and trigger guard at the back. One pulled the stock close into his shoulder whilst the other loaded a kind of small bomb into it. He then gave his comrade a pat on the head. There was a loud report from the weapon and immediately a second personnel carrier exploded in flames. He felt his wife suffer a small spasm and, looking at her, he saw that she had vomit running down her chin and over her hands and clothes. Her eyes were staring, glazed over, expressionless, and he knew that if he didn’t get her away and sedated quickly she might suffer catatonic withdrawal. Moving her back, he sat her down on his daughter’s bed. She was also in severe shock and was rocking back and forth, her arms wrapped in a self embrace, like an insecure child. He picked up the corner of the sheet and wiped the dribble from her mouth. He knew that if he could get her to do something she might avoid the more serious consequences of shock. She turned to face him then smiled. She moved over to her mother and embraced her. But he knew that she also was very close to the edge. The sergeant and the girl were together in the pantry arranging medical supplies. The jars of bottled fruit and other assorted comestibles had been piled in the corner of the small room and the shelves were now full of bandages, dressings, ointments and all the other pathetic paraphernalia of the field hospital. He wondered how long this would last against the rising tide of casualties which the battle was inflicting. The ferocity of the conflict was increasing by the hour. They both began to laugh. He looked at her and saw her differently now. It was the first time he had seen her smile and he was touched as it lighted her lovely young face, framed now by her unbraided flaxen hair. Still smiling at her, he shook his head slightly. He looked at her, at her tender yet expectant expression. He wanted to take her to him, mellow in the warmth of her. But he knew it could not be. Her young heart opened to him as a spring flower is touched by the sun. She stretched out both her hands and touched his roughened cheeks. He drew her to him and they kissed, clumsily at first, teeth striking, but then more warmly. Not passionately, but innocently with lips closed. He pushed her gently back, holding her by the shoulders at arm’s length. She saw that his eyes had welled with tears. As he spoke his voice broke with despair. As the tears seamed his grimy face, they drew together again. She began to sob against his chest and he stroked her hair gently. He was calmer now and his voice became more tender. 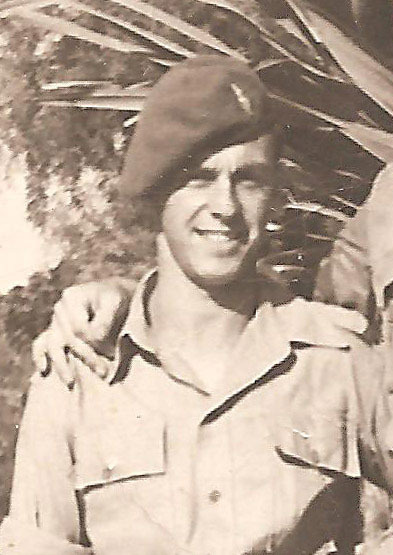 One of the few photos we have of William in uniform, taken in Palestine c.1947. I wish I could tell you more about who William the soldier was. Very few details about my grandfather’s time in the army are known by me or the family. Why? Because he very rarely talked about it. In fact, I don’t recall ever speaking to Gramps in any fine detail about the war until after his retirement. He found it very difficult and there were only certain aspects he was willing or able to talk about. It was only when he began writing that he began to open up about his experiences. He kept no personal mementos from the war or Palestine. There are only a few pictures, probably captured on a box brownie, and then dating from after the war ended. So what do we know about William the soldier? We know that he signed up at the tender age of 17, leaving a job in a factory in Harrow in order to join the fight against fascism. We also know that he took up the offer of joining the newly formed parachute regiment for no other reason than they were offering a few extra bob a week in pay. We know he undertook his training at Hardwick Hall in Derbyshire. He was only 18 years old when, 70 years ago this week, Private William Edward Thomas, along with thousands of his comrades, was dropped from a plane into a field on the outskirts of the Dutch village of Oosterbeek, and took part in a ferocious battle over the next 10 days to secure the strategically important bridge over the Rhine. It was a battle which was to have a profound effect on the teenager (strange to think he was only half my age now when he was there). As so many others did, he made some deep and lasting friendships whilst he was in the army. Whilst many undoubtedly never returned from the fighting (or returned to the regiment later, having been captured and taken prisoner) they were all remembered fondly for a long time after. Once William began to open up, most stories and anecdotes involved those friends. One in particular, Wally Callis, seemed very important to him. Even as the effects of Alzheimer’s Disease took hold, memories of Wally and their escapades would come back, together with the disappointment that they eventually lost touch (Wally emigrated shortly after leaving the army). By all accounts, it seemed that Wally and William – or Bill as most people seemed to call him – were an inseparable pair. Was it their double act that inspired the piano playing duo, “the Twins”, featured in Pegasus Falling? Gramps was an accomplished, if amateur, piano player, and I can just imagine the two of them entertaining their fellow troops in raucous revelry in the mess. It was in the army that William took up boxing, which he claims to have been very good at. I’d love to know if he was! He had the right build for it, and he maintained an interest in the sport throughout his life, something which surprised me, as he was a dyed-in-the-wool pacifist. But there was something about the art of boxing, the controlled aggression perhaps, which fascinated him. There are so many things about William the soldier that remain unknown, though. His exact role at Arnhem is unclear, although his recalling of events in his fiction shows that he was intimately involved on the front line. I’m not sure when or if he ever progressed to a higher rank than Private. We have no medals or uniform to give us a clue. How did he get back to the UK after fighting in Arnhem? Was he one of the many who were evacuated after the operation failed? What is clear is that his experiences left a heavy toll on him. He may have gotten through his time in the army physically unharmed, but Arnhem, and indeed Palestine, left him mentally scarred. He had signed up to fight because he felt morally obliged to do so, but he left the army with the unwavering attitude that war is wrong, and must be avoided at all costs. He did not feel proud of what he did in battle. The very fact that his medals and uniform disappeared, and that he did not open up about his experiences for several decades afterwards, tell you a lot. When ever the subject of the war came up, his very strong opinions would be aired. What happened was necessary, given the circumstances. What he was asked to do had to be done. But it was wrong, very wrong, and the circumstances which lead to him having to undertake such tasks should never have presented themselves in the first place. Not only that, but he did all he could to champion peace and prosperity for the rest of his life. He may not have been proud of his actions as a soldier, but one thing is clear. He had utmost respect for his fellow soldiers on the front line on both sides of the conflict. And that respect is clear to see in his writing. His characters live and breathe the same conflict he lived through himself. They take orders, they fight, they banter, they suffer, they laugh, they fall in love, just as he did out there. He may pull no punches in his criticism of those in charge, but there is no doubting the empathy with his fellow fighters who had to live with the consequences of the decisions that had been made above their heads. A lot of the gaps in our knowledge of Gramps’ time out there could possibly be filled by reading his books. Undoubtedly, much of what happens in The Bridge and Pegasus Falling is based on his own experiences, and I am so glad he left us these stories as they give us some clue about what he lived through. I only realised just how little I know about William the soldier when it was too late to start asking questions. Just as he was willing to start talking, Alzheimer’s began to eat away at his memories and the disease took away my opportunity to ask him more. But I hope that all is not lost. 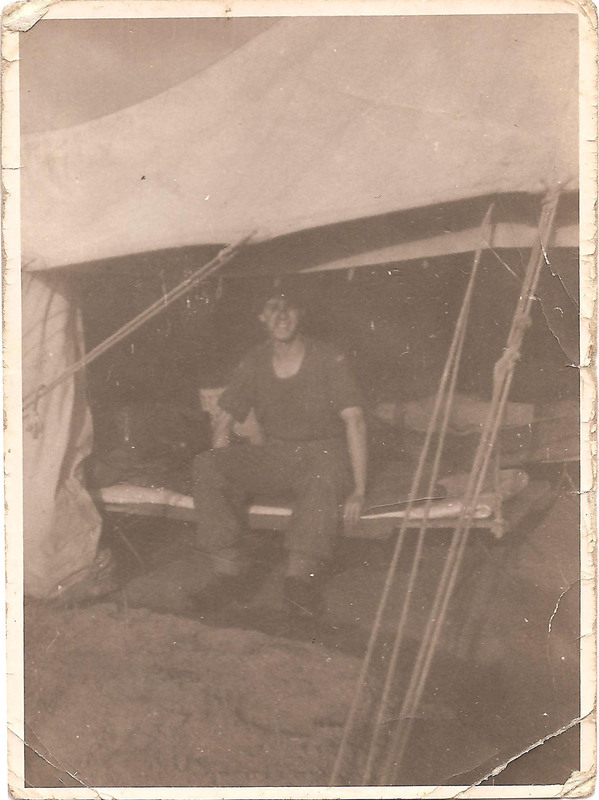 Once I have published the last part of the Cypress Branches trilogy, I’ll turn my attention to finding out more about Gramps’ time in the army. I’m sure there are records I can look at, and maybe one or two internet forums may come in handy. It would be great to one day write another blog post in the not too distant future filling in some of those gaps. Today, we continue with part 2 of the story. Click here for Part 1. Further instalments and Arnhem themed posts will follow over the next week. The doctor cycled quickly up the path, raised himself on the pedal and, swinging his leg over the frame, dismounted on the run letting the bicycle fall onto the path. He bounded up the front steps and into the house. His wife came out of the kitchen wiping her floured hands on her apron. She looked at her husband, incredulous at his excitement. She had never seen him so animated, never heard him shout like this. He followed his wife into the kitchen and sat down at the large oak trestle table. He watched her back as she busied herself at the stove. She had gone very quiet. He shook his head in frustration. When she didn’t get a reply, she looked at the boy in the mirror. Good old Per, she thought, head stuck in a book again. The jeep screeched to a stop outside the cafe across the street and the girl ran to the window to see what all the noise was about. The soldier had alighted from the jeep and was leaning on the canopy of the vehicle, talking to another soldier inside. They looked down, their young faces alive with excitement. The other soldier climbed from the jeep and began to cross the road toward the house. The one who remained straightened up, removed his red beret and began to scratch the back of his head with both hands, elbows held out wide. He looked toward the house and, noticing the two young people at the window, he tilted his head slightly, then raising his hand, he gave them a little wave. The boy shrugged but before he could respond they heard the doorbell. They both ran from the room and down the stairs to the front door. They opened it to a large, thickset man with a stern face under his red beret. He wore a green and brown camouflaged smock over his British khaki uniform and a large pistol hung from his belt. His whole attitude was intimidating and this reflected in the frightened faces of the two young people. The second soldier had walked up and stood just behind the first. The girl looked at him and he could see she was very afraid. His face softened with just the trace of a smile and he gave her a little wink. The Colonel ran back down the path and, climbing into the jeep, drove off at high speed. The sergeant looked at the girl. She just stared at him, unmoving. The sergeant looked intently at the doctor. The doctor looked into the sergeant’s face. He could see the fear begin to reflect in his eyes. He nodded slowly. He ran from the house. Written shortly after his retirement in 1992, this was the first story William wrote after he took up writing. Later, parts of it formed the basis of the first chapter of his longer book, Pegasus Falling. The battle of Arnhem (or Operation Market Garden, to give it its official title) resulted in the deaths of nearly 2,000 Allied and 1,300 German troops, and the wounding of many thousands more. It was a battle marred by poor planning and faulty intelligence, but also noted for the heroism and courage shown by the young soldiers sent to fight an unwinnable battle. William’s story tells of the drama and tragedy of those 10 days through the story of Sergeant Bill Grant, and his brief encounter with a local woman which would go on to affect him his entire life. Although a work of fiction, William drew on his own experience of those bloody days and nights, for Private Thomas, William E. was there, fighting on the front line himself. Many of the characters in the story are probably based on fellow comrades and locals. The fact he was there to witness the true horror and hardship suffered by both the solders and the civilians caught up in proceedings makes the drama in his story all the more palpable. Today, we begin with part 1 of the story. Come back tomorrow for Part 2, followed by further instalments and Arnhem themed posts over the next week. The woman moved to the window, attracted by the hubbub. She looked toward the river. A large articulated truck had broken down on the bridge and traffic was backed up in both directions as far as she could see. A police car had stopped across the bridge ramp and the officers were remonstrating with the driver of the truck. Many drivers had left their vehicles to try to see what was going on. While she watched, her attention was drawn to one driver in particular. A short, middle-age man was leaning on the top of his car and talking to someone inside through the open sunroof. There should have been nothing unusual about this, yet she was drawn to look at him by some vague sense of de ja vu. These harmless, chiding words prompted a more poignant memory. She raised her right hand to cover her mouth and her eyes widened with apprehension. She turned to face her husband. He looked hard into her face then turned his head slowly to look down at the man again. He drew her closer to him. She felt stiff and still held her hand to her mouth. They stared for what seemed an age at the man, then slowly turned to look at the chaos on the street, at the German truck blocking the bridge, then back at the man again. It was as though he felt some presentiment, for the man straightened, scratched the back of his head with both hands, elbows out, and looked up at the house. When she saw his face, she knew. The man was still looking up at them with a slightly quizzical tilt to his head, then raised his hand and gave them a little wave.